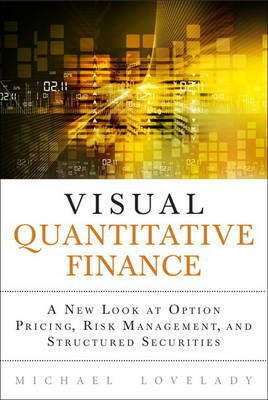 This book makes quantitative finance (almost) easy! Its new visual approach makes quantitative finance accessible to a broad audience, including those without strong backgrounds in math or finance. Michael Lovelady introduces a simplified but powerful technique for calculating profit probabilities and graphically representing the outcomes. Lovelady's "pictures" highlight key characteristics of structured securities such as the increased likelihood of profits, the level of virtual dividends being generated, and market risk exposures. After explaining his visual approach, he applies it to one of today's hottest investing trends: lower-volatility, higher-income strategies. Because of today's intense interest in alternative investments and structured securities, this book reviews their unique advantages to investors, managers and advisors of retail and institutional portfolios. Visual Quantitative Finance focuses on key topics directly related to the design, pricing and communication of structured securities, including stochastic price projections and the framework underlying options pricing formulas. The key is Lovelady's explicit use of probabilities in a spreadsheet format. By working directly with the underlying assumptions, he transforms the Black-Scholes framework into five columns of a simple Excel spreadsheet, with no complicated formulas -- making structured securities far more intuitive to design, evaluate and manage. For all investors, students, and financial professionals who are interested in quantitative finance, risk measurement, options pricing, structured securities, or financial model building - and for everyone who needs to explain these topics to someone else. For those with quantitative backgrounds, this guide offers powerful new tools for design and risk management, simplifying the design and evaluation of innovative instruments. For everyone else, Lovelady makes the subject comprehensible for the first time.